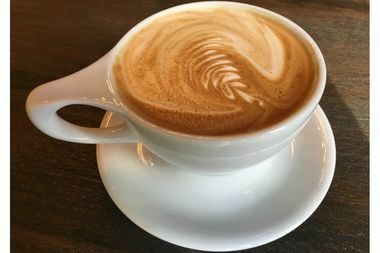 Southern Cross Coffee is now serving pastries and expresso drinks at 300 E. Fifth St.
EAST VILLAGE — An Australian and an Argentine have opened a new coffee shop in the East Village that draws from the cafe cultures of their home countries. Southern Cross Coffee, which officially opened its doors on Saturday at 300 E. Fifth St., is named for the famous constellation that guided travelers in the Southern Hemisphere before compasses were around, explained Argentine co-founder Sergio D'Auria, noting the cluster of stars is an important part of his culture as well as that of his Australian business partner Adam Sobol. "It's something that's a shout out to our heritage and to our ancestors," explained D'Auria. And the constellation isn't all the two countries have in common, said D'Auria — the new East Village shop was born out of the love of coffee and food shared by both Australia and Argentina. "Both countries have a very large Italian population, so coffee is pretty important and food is a big deal too, of course," said D'Auria, who hails from Argentina, while Sobol hails from Australia. The duo aimed to recreate the Argentine concept of the "confiteria" — a cross between a bakery, a sandwich shop, and a coffee shop, explained D'Auria — though they have dialed down the scale of the project for now to simply pastries and coffee, with tentative plans to eventually expand the menu. The partners wanted to create a place where neighbors can make themselves at home while enjoying local goods, D'Auria said. The space uses coffee beans from Brooklyn Roasting Company and pastries from Colson Patisserie, which are handmade in Brooklyn. "[We] tried to create a good community-focused place that uses local products where we could," D'Auria said. "We're hoping people come hang around and chat, and make it a place were people can come and spend time and not feel rushed to leave."